Our girl who came from the local pound is really a Princess. She firmly believes this. Her given name was Russian (perhaps her previous owners thought she was a Russian Blue kitty) or perhaps they were just Russian speaking. We were lucky to find such a gorgeous, intelligent, luxuriously soft and inquisitive girl. We are fairly certain she is actually a French Chartreux. She has gorgeous green eyes which would be considered a “flaw” by the breed standard. Perhaps she was discarded or sold to a careless owner due to this. What is a French Chartreux? 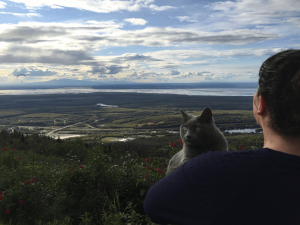 Both Russian Blue and French Chartreux as well as a few other breeds have what is known as “blue” fur. It is a gorgeous slate grey. The French Chartreux has an extremely thick coat which was actually dyed and sold as sea otter fur! It is water repellant like sea otter fur as well. They were hunted for their fur in the 18th and 19th centuries. The breed almost went extinct between WWI and World War II in Europe and was not brought to the U.S. until 1971. There are many theories about the origins of the breed. Some say they were brought from the middle east back to Europe during the Crusades. The breed may have originate as wild cats in Syria or Iran. Some of these crusaders became Carthusian monks when they returned. The head order called the Grand Chartreuse was located in the Chartreuse Mountains. Living in monasteries is said to be why the cats are so quiet. The Carthisian Order monks were silent themselves. French Chartreux cats don’t say much and only meow when they really want something. One theory is that the cats are so smart they will mimic their owners so if their people didn’t speak, they didn’t either. This makes sense because cats only vocalize like they do now in order to communicate with us! So, if they lived with silent people they would probably not learn to vocalize like we are now accustomed to them doing. Our princess is not silent…she is quiet most of the time but she certainly makes herself noticed on the occasions she decides to speak. How Did a Rare French Chartreux end up in the pound? They are said to have been rescued between the wars by two French nuns who raised them on an island off France. If it were not for concerted efforts to save the breed they would have gone extinct due to hunting for their fur and meat in Europe. There were no feral colonies left after WWII. They are still rare even in France. 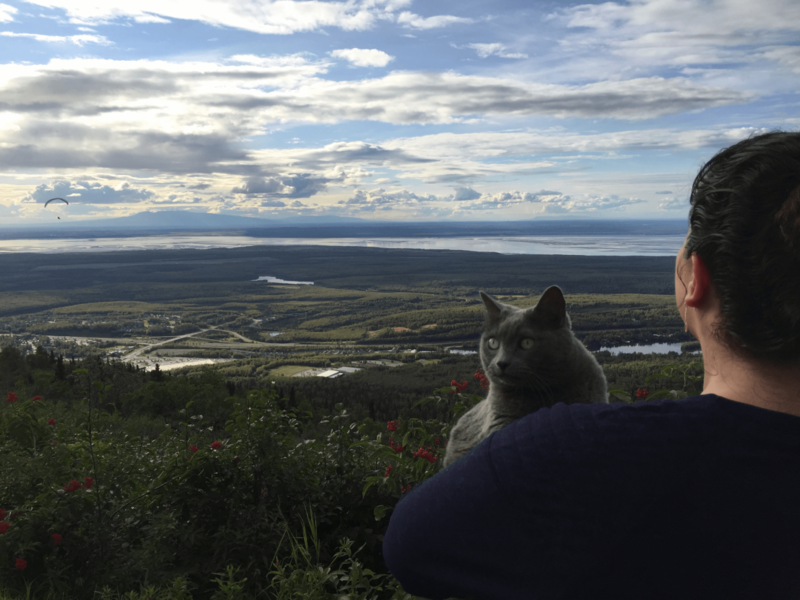 Who knows how a French Chartreux ended up in the pound here in Alaska. Apparently the breed was at the height of it’s popularity leading up to the year 2000. There were more breeders then then any other time and the number has fallen back down now. Perhaps she was descended from one of these breeder’s lines but was discarded due to her gorgeous green eyes. Only orange and amber eyes are accepted in the breed standard and this is a “flaw”. I saw her picture online on the list of cats at the local animal shelter. We already had our first kitty, our sweetest orange tabby boy and wanted some company for him. We wanted someone for him to play with and be with when we were gone to work. We needed to “get our kitty a kitty”. So, we went to the shelter and found her and I was so excited I remember calling to my husband “I found her!”. She looked un-interested at first but then decided to meow at me (now I know that was a big deal). It turned out our plan to get our boy a playmate, was a failure. The princess had no intention of playing with the annoying boy cat brother. She didn’t like him much at first. Eventually though they became close buddies and would sleep curled up together every single day. They still fight sometimes (when our boy gets feisty and decides to bite her on the neck or chase and tackle her like he is a Tiger) and we have to admonish him. They seem to really care about each other though the rest of the time. She can be quite playful on rare occasions when she feels like it. She likes to play fetch for example. It took over a year for her to warm up to my husband. She just didn’t want anything to do with him. Whenever he tried to hold her she would growl and squirm and scratch with her vicious back claws. She was already declawed in the front when we got her (I would not do that to my own cats) and she learned to compensate with her back claws. Now, however she is “Daddy’s girl”. She likes to snuggle up to him when he goes to bed and sleep between our heads. Our first boy likes to sleep there too so they take turns being on me and between us. She is definitely the smartest of our three cats. She figured out how to use the puzzle feeder on the first day. After 3 weeks I gave up on the boys ever learning. I showed them myself how to reach their paws in and pull the food down. They watched as she did it. They just never figured it out. Of course I never let them get really hungry so they had to figure it out! I think some of it is due to the breed. Some cat breeds like some dog breeds are just more intelligent than others. In any case our princess is the smarty pants of the house. She is also the adventurous one. She likes to go outside (as they all do) and it is quite a chore to keep them in in the summer. Princess however, will walk like a dog and go with me outside. I can take her on walks on trails and she likes to see the plants and birds and bugs and smell the breeze. If she gets tired I will carry her but we generally don’t go too far. I think the exercise is great for her and I would like to do it more often. At our old house before we moved, there was a trail and open land nearby. Now we don’t have that and I don’t want to walk near cars and dogs. So, yesterday we took her up the mountain behind our new home. We drove up to the top and took her for the adventure. She probably would have been just as happy snooping around close to home but she was a good sport about the whole thing. She was not scared or anxious and didn’t even attempt to use those weapon-like back claws! She was perfectly calm when a paraglider quietly drifted right over our heads. She didn’t seem too concerned. French Chartreux are know to be good travelers as well. They can be happy living in RVs and with truck drivers! I want to find ways to keep her active since she is overweight. The breed is known for their pudgy build. I hope to get a kitty exercise wheel and we will see if she will actually use it! The princess might not be too excited about such a concept. She is prone to upper respiratory infections as are so many cats that end up in shelters. They can carry the virus in a dormant state for the rest of their lives. It can pop up with symptoms at any time but any type of stress can bring it on. In order to keep her healthy I use a home remedy and supplement reviewed here. I also give her PetAlive Gumz-n-Teeth to keep her teeth and gums clean and healthy and prevent bad breath. I feed her a high-quality grain-free dry food as well as wet food. I hope to make pet health care easier and more affordable so more great pets can be rescued. Please see my reviews of cat food, cat litter and other health and behavior products and leave a comment below. Thanks! As one who appreciates the complex personalities of many cats, I really appreciate this history lesson and personal story of your princess. I did not know of the breed, even though I’ve encountered a few cats over the years that might be relatives of hers. You clearly know your cats well, so I will be checking your tips to help keep our cats as healthy as your princess. I do have a question: do any of your three cats attempt to groom the others? Yes, they all groom each other some. Mostly our first boy and the princess since they have been together the longest. Occasionally the two boys do too. However, grooming often seems to annoy the groomee and they end up fighting or at least swatting at each other. Sometimes they seem to groom knowing it will start a fight, like they are just goading each other on. It depends on the mood they are in I guess. Cats are beautiful animals. not just for their appearance but their demeanor and personalities. We have several(and dogs) and are happy with watching them and how they are with their animal friends. thank you for sharing this. Thanks Brent. Yes, it is so neat when you see how they each have their own personalities just like people. They are capable of love, compassion, sadness, jealously, excitement, all the same emotions we have! I love cats because they are so calm and collected. I had one who went to college with me and she was more than a handful when I left her alone while I went to class. So I understand when you said the Princess had her moments. She is so beautiful. Cats have very different personalities. Most have at least some degree of calm and collected about them though. Thanks! I enjoyed reading the story about your princess very much. She absolutely looks gorgeous with those green eyes. One really wonders how such a great animal ends up in a shelter. I have always loved cats. My Mother told me the following story. I was born in Australia and in the small pension where we lived, Papa some 1000 miles away working in the Snowy Mountain project, there were a couple of cats. I was still small but would get hold of any cat passing me close enough and would squeeze and cuddle them. I had very fluffy hair and the cats would never scratch me but lick my head, they knew I was a baby. I am happy your princess found such a loving home. I have thick, curly hair and Princess tries to groom my hair too. She licks it but my husband says she looks annoyed since the it is too long and it doesn’t work right! We are lucky to have three wonderful cats who are all are rescued. I will be adding two more posts on our sweet orange tabby boy and our Norwegian Forest Cat as well. Thanks Tim. I didn’t know anything about them until we had our girl. They are pretty rare still. It is so interesting to try to piece together the history of the different breeds. Hi Jessica! I am so glad to meet another cat lover! 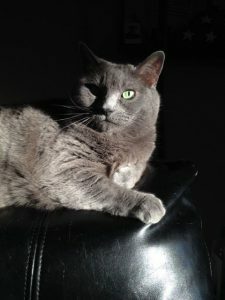 I am definitely a “kitty” person:) I loved reading about how you found your precious French Chartreux:) I had actually never heard of this breed, but she is so beautiful! I had a rescue cat for almost 18 years. She had been starved, beaten, kicked, and neglected. It took a while for her to understand that I wanted to love her, and give her everything she hadn’t experienced previously. She finally let me into her heart, and quickly became my “child!” I definitely think that people who are looking for a sweetheart of a cat to love definitely need to look into rescuing these animals from animal shelters. Some of the most exquisite and lovable animals can be found there! I’m truly glad that you and your husband found your princess! That is wonderful you took such good care of your girl! I am glad she was able to have a better life with you and come to understand love. It is amazing to me how long it takes for rescued cats to feel completely comfortable. They may sleep on you at night, let you pet them and act fairly normal at first but it can take a year or more for them to feel relaxed and many years in some cases to feel truly part of the family and completely comfortable and secure. Our princess is a perfect example. She still gets sweeter and sweeter even after 8 years! Just in the last few months she has started getting cuddly. She likes to cuddle with my husband every day now! She used to not like him at all. Then so tolerated him. Then she would be near him but still didn’t want to be held long. Now she lays right next to him and purrs and wants to be babied! I doubt I will ever buy a pet from a breeder. All of my pets are rescued and we desperately want to go adopt more! The problem is all three of the 16 pound cats insist on sleeping on top of me now! I don’t know how many more I can take! They like being on me and close to each other when they sleep. Hello Jessica, I really enjoyed reading the story about your French Chartreuse. I had one when I was in Europe, she was very special, she used to sleep with my son , every night,when I was telling a story to my child, we were calling her to come and she ways right there in the bed. We lost when she was 19 years old. Today I live in California and have six cats from different breed, they just appeared and adopt them. One of them is black with flat ears, my husband called him “Napoleon” he used to come every single day for food ,sometimes disappear for few weeks.Today, Napoleon seems to retire in our couch,very old and happy. I like your website,full of information.Thank you. Yes, our girl comes when she is called too and is very responsive. She is so intelligent too! She is the adventurous one of the cats and is not afraid of anything. I am glad you share your life with so many kitties!